Over the last several posts, I’ve argued that it is unlikely that Paul’s words in Philemon 15-16 can be interpreted to mean that Philemon and Onesimus partake of a common humanity. I think that it is more likely that Paul indicates that Philemon and Onesimus are brothers. This is the most natural reading of the expression adelphon en sarki and at least two scenarios can account for it. First, it may be that Philemon and Onesimus are two sons of the same mother and father. Philemon is the older brother upon whom their father has conferred the management of the household, comprising any number of smaller family units, other relatives, and slaves. Onesimus is the younger son, born free, and the recipient of a smaller inheritance which he squanders and ends up selling himself into slavery (cf. Luke 15). Such a situation would bring shame on Philemon, threatening his ability to do business with others of his social class. Onesimus is not Philemon’s slave but has become a slave through his own folly. Philemon must then buy him out of slavery and bring him home perhaps to punish him in some way in an effort to restore the family’s honor and the household’s economic viability. This scenario accounts for the fact that the imprisoned Paul can send Onesimus back to Philemon. It also accounts for all the language in v. 16—that Onesimus is a slave and Philemon’s actual brother. The only obstacle for this scenario is that “Onesimus” is a slave name. A second scenario—and perhaps the more likely one—is that Philemon and Onesimus have the same father, but that Onesimus is born to a slave woman. In such a case, Onesimus would share the same status as his enslaved mother and would not be considered a legitimate brother to Philemon nor an heir of his natural father. Female slaves often served as sexual partners for their owners and their children in such situations, would have no claim on their “father’s” property. A paterfamilias would have no qualms about fathering children in this way. Slaves didn’t have fathers, in this sense, so a slave born to a slave woman would have no claim to be the legitimate son of such a father. Free men who fathered children by female slaves had no obligation to acknowledge their paternity and only rarely did so. 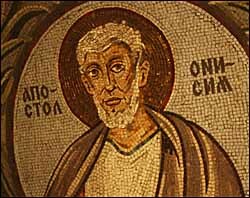 If Philemon and Onesimus are in fact half-brothers, then much of the consensus view is unthreatened. Onesimus is still regarded as a slave in the household of Philemon and in some way brought harm to Philemon and has made his way to Paul. Paul sends Onesimus back to Philemon urging the latter to receive the former as Paul himself. The consensus view would need modification, however, to recognize the additional factor that while Philemon is the freeborn master of the household, Onesimus is now Philemon’s brother in the Lord, having been converted to Christian discipleship by the Apostle. This new relationship in the realm of “the faith” goes beyond the already-existing relationship in the realm of natural relations, in which they are also brothers, sharing a common earthly father. My main contention in these posts is that commentators must take Paul’s reference to Philemon and Onesimus as adelphoi en sarki with greater seriousness. It is highly unlikely that Paul regards the two as sharing in a common humanity. It is far more likely that they are actual brothers. This may demand a re-consideration of the scenario that eventuates in Paul’s letter, even though any modification to the consensus view need not be as dramatic as the view advanced by Callahan. Read this insightful proposal by Tim Gombis that Philemon and Onesimus were brothers. The reconstruction sounds convincing and will provide fresh ways to read Paul’s letter. You make a great case; commentators must take Paul’s reference to Philemon and Onesimus seriously. What’s you’ve presented is convincing that ‘mere humanity’ is not meant by ‘adelphon en sarki’ and that some type of blood relation is evident. At a minimum this assertion of blood relation can be supported. However, some type of ‘blood relation’ can be many things. For example, there is evidence Paul treated his kinsmen, fellow Israelites, as his cognate brothers. These examples even employ the same language. In [Rom 9:3] Paul says “For I could wish that I myself were accursed and cut off from the Anointed One for the sake of my brothers, my kinsmen according to the flesh” meaning Israelites. Later, he makes it clear he’s talking from the perspective of descendants of Isaac as a common ancestor [Rom 9:10]. You’re reasons have jumped immediately to the rather speculative notion they were half-brothers through a slave-woman (which is speculation at this point we have no justification for). Can we assume your intention is not to simply explore unfounded speculation before first exploring the evidence that does exist (both in the Old and New Covenant Greek text) suggesting how this use of this word implied kinship? I can’t say for sure that Onesimus is a son of a slave woman. I’m only offering a suggestion for making good sense of Paul’s words that they’re brothers in the flesh and that Onesimus is a slave. It seems reasonable to guess that these two facts Paul mentions in v. 16 may come together in Onesimus being the offspring of a slave woman. I can’t prove that this is so, but am offering a suggestion. Ok fair enough, but in exegesis don’t we start with the text itself? Scripture, which Paul was familiar with, spoke frequently about the enslavement of Jacob (Paul’s kinsmen according the flesh) so to explain slavery shouldn’t we consult scripture to explain history? Clearly the House of Israel was to be slaves. This begs the question – If Jacob was to become a slave, a prize of war (as [Jer 39:18] says) who are the people they would be enslaved to, and which land of their captivity, or land far away would we find them in when David (Jesus) returned? These questions are all answered in scripture. In [Dan 8:5-12] Daniel shows us a vision: the Ram with two horns is the Assyrian empire split as the Medo-Persian empire which then cedes to the goat (or the Greek Alexander the Great whose banner was a goat). Many find prophecy difficult, but this can’t be clearer given that Daniel interprets the dream in [Dan 8:20-26] and only Alexander the Great conquered the Persian empire; only Alexander the Great split his empire into four, a Satrapy for each of his generals, which is what the goat does in [Dan 8:8]. Of these generals Seleucus I Nicator established the Seleucid dynasty which the 3rd Satrapy grew out of. Daniel tells us about this little horn grew exceedingly great, which he says was the Achaemenid Persian Empire (or the Parthian empire). This empire was ultimately thrown down by the host (the Roman Empire) who would also make desolate the sanctuary [Dan 8:13] (Only the Roman Empire threw down the Sanctuary and conquered the Achaemenid Empire). As already said, Daniel interprets this Assyrian, Medo-Persian, Greek, Parthian, Roman cycle in [Dan 8:20-26] so there should be little debate. Therefore when Rome conquered the Parthian empire, it left Israelites as enslaved Greeks within the Roman Empire, as well as so-called Greek freemen (really Leucosyri) within cities of the Greek regions as (Cappodocians, Galatia, etc). You are raising excellent questions, however it is less speculative and more biblical to suggest that Onesimus may have been an enslaved Leuco-Syrian Israelite and Philemon a free Roman (like Paul) than to be proposing hypothetical relationships… If we are going to speculate, it make more sense to go back to what we know, trust, and believe from scripture for answers, than to explore things with no apparent foundation .. does it not? Yes, of course, but the context typically makes it seem clear when specificity is required and it appears in a narrow sense and when it being used in broadest Hebrew sense as Paul’s typical usage of the word is used (in nearly every instance). I don’t deny the literal interpretation you suggest. I agree, it is a plausible interpretation, but not the most likely. I favour the broadest interpretation because contextually it makes the most sense, and is far more favourable to Paul’s typical usage. Also, one doesn’t need to jump through such exegetical hoops to get there, and there is biblical and historical context that makes it most likely. For example, look at [1 John 5:16]. Do you see it’s application in the broadest sense (meaning Israelites of common ancestor parents) or in the narrowest literal sense (meaning children of immediate parents)? Whichever way you interpret [1 John 5:16], can you explain why you go that route? I look at verses such as [I thess 3;15], [Col 4:7], and [Eph 6:21] and take them in the broad sense describing kinsmen, fellow Israelites. I see [Jude 1:1] in the narrow sense because of context. Biblical language treated one’s neighbour as one’s brother because it was addressed to people of a common covenant who inherited that covenant from common ancestors. They lost access to that covenant due to poor conduct (such as Esau). This is how Paul describes himself seeing it. The general observation ‘the phrase refers to a blood relationship‘ is correct, but if this case is going to be made and it does not conform to Paul’s typical broad usage, the question needs to be addressed of why the narrow relationship applies rather than the broad one, (given the phrase’s abundant appearance in Pauline work as well as OT scripture (LXX) in the broad sense). It doesn’t seem to me to be so theologically loaded. In response to your question, I’d only say that the reason for the narrow sense of “actual brother” is that Paul’s words are that he is a “brother, both in the flesh and in the Lord.” That is, an actual brother as well as a fellow Christian. That doesn’t seem like jumping through exegetical hoops to me. So do you take [Rom 9:3] in the same narrow sense also then? Agreed, but Paul’s use of brother in the narrow sense appears only once in all of his work, and it is the exception, otherwise he always appears to use it in the broad sense. So do we generalize the many from the one? In [Col 4:9] Paul says of Onesimus ..”and with him Onesimus, our faithful and beloved brother, who is one of you. They will tell you of everything that has taken place here.“. How is this reference to Onesimus different from the one in [Phil 1:1,7]? Do we take this to mean Onesimus is also Paul’s brother? A brief Survey of the appearance of ἀδελφῶν by Paul. Exegetically, if we’re going to interpret against the norm, substantiation is warranted. What is unique about this instance is that Paul stresses that he’s speaking about a brother in the flesh. Yes, in a sense but I believe that works against a narrow interpretation. Paul is emphasising the accord between being a brother in the flesh (a broad community) and a fellow believer (also a broad community). Idiomatically there is more affinity (and rhetorical force) in comparing membership within a ‘community of believers and a ‘community of Israelite descendants‘. In this view Paul is saying he (Onesimus) is not only a believer but a fellow Israelite. Nevertheless, you disagree. That’s fine. I’m not trying to commandeer your line of thought, and I am looking forward to the other arguments you give. I like how clearly (and charitably) you express your objection to convention. Fascinating and utterly sensical proposal! I’m working on it — send me your paper, if you don’t mind, I’d love to check it out! Thanks for this, Dave. I sent you the paper via email. Let me know if you don’t get it. Hi Tim, did you publish the paper you mentioned you were going to publish about this issue? Send me your email address and I can email it to you. Find my address on the Grand Rapids Theological Seminary site. Hi Tim. Did you publish the paper you mentioned here in the comments section? I’m very interested in reading it.